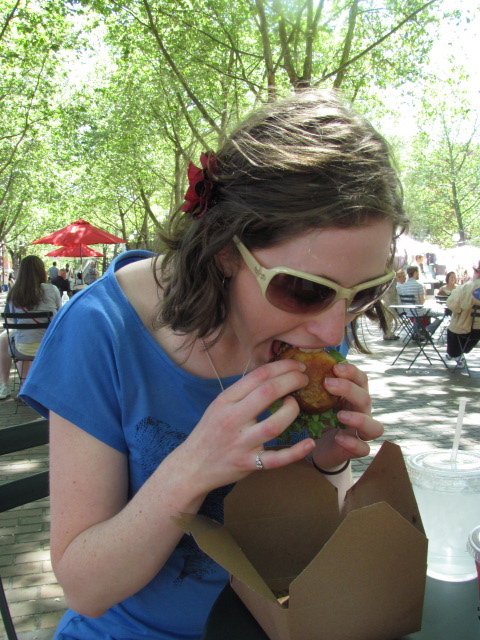 Being a part-time Seattle foodie, I have, of course, heard of Skillet Street Food. This airstream trailer travels around Seattle serving up some amazing American food with a Seattlite twist. I had heard of them, but hadn’t really gone out of my way to find them. I really should have been more attentive to the roar coming from other Seattle bloggers. If I had listened I wouldn’t have gone so long without this burger, which really is a shame (not the burger that is, the lack of my tasting one!!). But now that it has entered my life, I intend to make up for lost time. 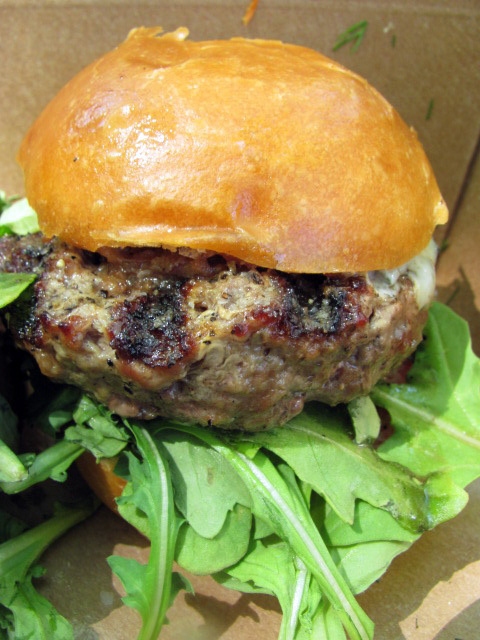 This photo makes the burger look huge (but looks can be deceiving) which is okay, becasue this picture fully captures the flavor of this grass-fed beef burger with arugula, bacon jam and cambozola on a soft roll. It is what is called “slider” size, which is about half the size of a normal burger. Alaina and I both agreed that if it had been normal size we would have been very, very sick but we would have eaten the whole thing because it is just that good. Oh, and then their are fries and blackberry lemonade, both handmade…from scratch! 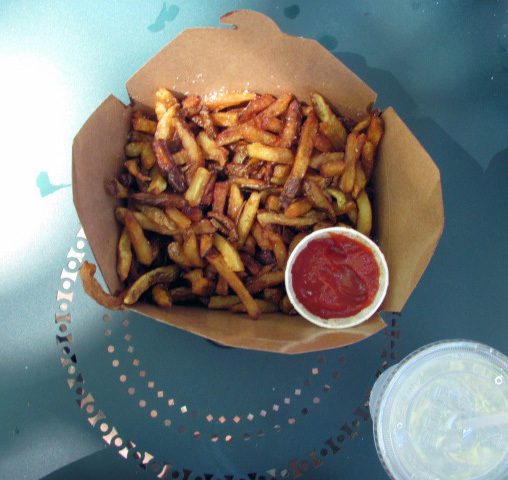 These fries are a meal in themselves. We couldn’t even make a dent in them, though believe me we tried our darnedest! Alaina went for the soft ones, I went for the crunchy ones. Tossed with herbs, my guess is parsley, and sprinkled with sea salt. I will never be able to look at fries the same way again. While on our way to China town for the best Mu Shu Pork, we had the good fortune of being sidetracked by a new outdoor market that is just starting up in Pioneer Square. Last week was only the second week, but it will continue all summer. I would rank it high on the list of things to do this summer. Great vendors selling all kinds of found and handmade things and some of the best street food you will find in Seattle all in one sunny urban park. I have to hand it to Alaina, some of the best things in life really are rather serendipitous. This entry was posted in Eat here!, Street Food. Bookmark the permalink. great write up! serendipity at its finest!